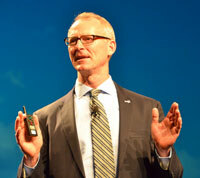 Former Republic Congressman Bob Inglis of South Carolina brought his message of conservative climate realism to the 2016 National Biodiesel Conference opening general session. “Free enterprise can solve the problem of climate change,” said Inglis, who talked about the Energy and Enterprise Initiative he founded in 2012. RepublicEn, as it is called, is a nationwide public engagement campaign promoting conservative and free-enterprise solutions to energy and climate challenges. “I’m very happy with what I’m doing now because it gives me the opportunity to be about something that’s big enough to be about,” he said.